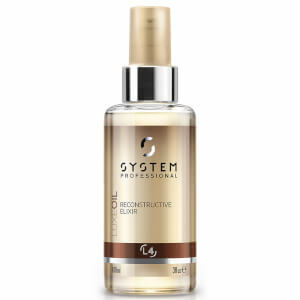 Achieve salon-worthy results from home with the System Professional Luxe Oil Reconstructive Elixir; a weightless, multi-purpose formula developed for all hair types. Harnessing the powers of nourishing Argan, Jojoba and Almond Oils, the rejuvenating elixir enhances softness and manageability, whilst promoting a sleek, glossy finish without greasy residue. Can be used on wet hair as a styling aid, or on dry hair for luminous shine. Ideal as a leave-in treatment, a conditioning elixir, a cutting support and a finishing product to eliminate frizz and defend against heat damage, UV rays and mechanical stress. Påfør to-tre dråper med olje på lengdene og hårtuppene. La håret tørke naturlig eller bruk føner.